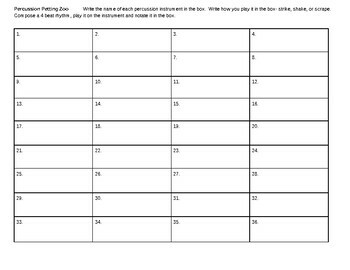 Here's an easy fun worksheet for students to explore the percussion instruments! They will identify the instrument, learn correct technique in playing that instrument, and compose a 4 beat rhythm to play on that instrument. There are 2 templates available. One with the instrument names inserted and one without. This download includes the template without instrument names.